The court held that the ‘Eighth Amendment’s prohibition of cruel and inhuman punishment guarantees individuals the right not to be subjected to excessive sanctions. This right originates from the basic precepts of justice that punishment for crime should be graduated and proportioned to both the offender and the offence’. The court acknowledged that, for purposes of sentencing children are, constitutionally different from adults because of their diminished culpability and better prospects of reform. Three differences between adults and children were pointed out by the court. Firstly, children have a lack of maturity and an underdeveloped sense of responsibility that result in reckless and impulsive behaviour and thoughtless risk taking. Secondly, children are more vulnerable to negative influences and outside pressures from peers and family. They have limited control over their environments and settings that maybe horrific and crime producing. Thirdly, their characters and traits are not as well formed as those of adults and their actions not as likely to be signs of ‘irretrievable depravity’. It is these attributes of youth that weaken the justifications for the imposition of harsh sentences on young offenders. The court also held that the obligation to impose mandatory punishment ignores the possibility of rehabilitation even when the circumstances point to such an option. It therefore held that the Eighth Amendment forbids sentencing that requires life imprisonment without the possibility of parole for young offenders. As a result of this judgment, offenders that were sentenced to life imprisonment under mandatory sentencing regimes before their 18th birthday are now entitled to new sentencing hearings. However, this may prove to be difficult as the hearings must be initiated by the prisoners themselves and prisoners asking for new hearings do not have a constitutional right to counsel. It is interesting to note that the court above applied constitutional principles similar to those used in a 2009 South African Constitutional Court judgment. In this matter the Centre for Child Law had challenged the constitutionality of the Criminal Law (Sentencing) Amendment Act which provided that minimum sentences should apply to 16- and 17-year-old offenders. Minimum sentences entail long periods of imprisonment, prescribed for particular crimes, including life imprisonment. The Centre approached the High Court with the constitutional challenge. The High Court found that applying minimum sentences to 16- and 17-year-old offenders was not in line with section 28(1)(g) of the Constitution which provides that children have the right not to be detained except as a measure of last resort, and then, if detention is unavoidable, only for the shortest appropriate period of time. 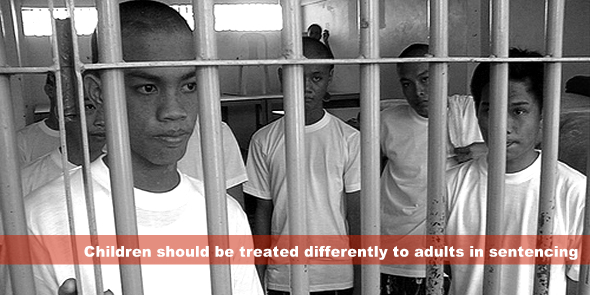 The High Court held that in cases pertaining to minors, the courts must consider all available sentencing options, especially non-custodial sentences, before considering detention. The Constitutional Court was approached to confirm the decision of the High Court. It confirmed the decision and held that the Constitution envisages that detention of young offenders may be possible, but it mitigates the circumstances of detention. It confirmed that for minors, detention is not a first or intermediate resort but a last resort. The Court held that each individual case needs to be examined on an individualised basis so that an appropriate sentence can be found. It stated that ‘legislation cannot take away the right of 16 and 17 year olds to be detained only as a last resort, and for the shortest appropriate period of time, without reasons being provided that specifically relate to this group and explain the need to change the constitutional disposition applying to them’. These judgments confirmed that children should be treated differently to adults in sentencing, no matter how old they are. Both courts were of the view that children are less physically and psychologically mature than adults, more susceptible to pressure from others and more receptive to rehabilitation than adults. Zita Hansungule holds an LLB degree from the University of Pretoria, South Africa. The author works at the University’s Centre for Child Law as the assistant project co-ordinator in the Centre’s monitoring, evaluation and communication projects. She is currently pursuing her LLM in Child Law at the University of Pretoria with a focus on the socio economic rights of children with disabilities in South Africa.